To spark discussion, the Walker invites local artists and critics to write overnight reviews of our performances. The ongoing Re:View series shares a diverse array of independent voices and opinions; it doesn’t reflect the views or opinions of the Walker or its curators. 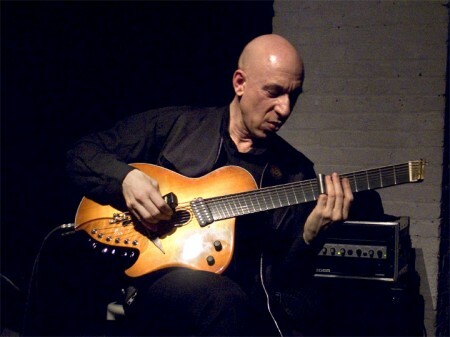 Today, filmmaker and writer Justin Schell shares his perspective on Thursday’s performance by Elliott Sharp. Agree or disagree? Feel free to share your thoughts in comments! 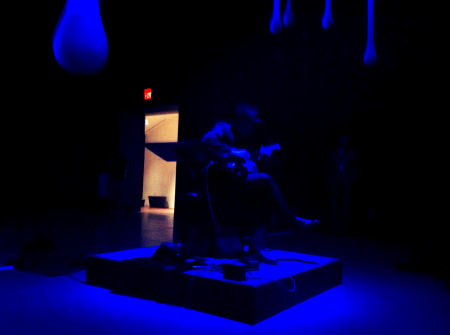 The second installment of the Walker’s Sound Horizon series featured multi-instrumentalist Elliott Sharp taking his spot underneath Ernesto Neto’s otheranimal. He played selections from his work Octal (on a self-made combination 8-string guitar and bass) and then some improvisations on a curved soprano saxophone. The two, however, blended into each other, their only demarcating feature was his putting down the guitar and picking up the saxophone. Elliot Sharp. Photo by Justin Schell. Sharp utilized a huge variety of techniques on both instruments, summoning amazingly diverse sonic textures from each instrument, whether it be the percussive slapping on the “bass” side or the furious two-handed fretboard picking on the guitar, to skronks, screeches, and circular breathing-fueled runs of blistering scales on the soprano saxophone. And the fact that he didn’t need any effects pedals or laptops only made it that much more astounding. One of the best things about Sharp’s performance had nothing to do with him: I was really happy to see a whole family sitting right up front, with a bunch of little ones in front of them, taking in all of Sharp’s sounds. As opposed to all the folks who ducked in and ducked out on their way through the galleries, it was a wonderful thought that these little kids could hear these thoroughly unconventional sounds at an early age, before their tastes are molded by run-of-the-mill musical convention. Unfortunately, those kids didn’t hear a whole lot of Sharp, unless they went to all three shows: his set disappointing lasted just over 15 minutes. It was a pretty phenomenal 15 minutes, but there certainly was time—and demand—for more.